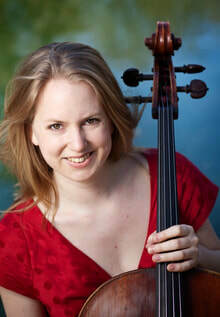 Danish cellist Dorte Rolff-Petersen works as both Suzuki teacher and performing artist with extensive experience in symphony orchestra and chamber music. 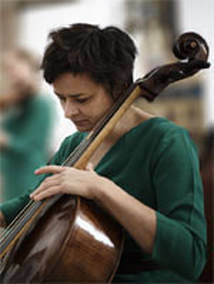 She has devoted herself to perform as a baroque cellist and is a member of the Aarhus-based ensemble Baroque Aros. Dorte is the Artistic Director of Aarhus Cello Expo 2018 - a cello festival she hopes to continuously develop and expand. Sofia Lind Pedersen was born in Munkfors, Sweden. Trained at the Falun Music Conservatory and with celloprofessor Henrik Brendstrup and Harro Ruijsenaars at the Royal Academy of Music (RAMA), Aarhus. In May 2010, Sofia made her debut from the RAMA soloist class (diploma). She has also completed her studies with a "Long Term Career Development Residency" in chamber music at The Banff Center of Arts, Canada. In addition to being an active cellist and performer, Sofia works with education and co-operation at Aarhus Music School and MGK East. Sofia is passionate about the experimental art and the curious approach to all kinds of music and also organizes concerts as a member of the Board of Aarhus Tonekunstnere (Aarhus Young Tone Artists). Mette has a bachelor from Visual Communication from the Danish Design School. She is an animation instructor from The Danish Film School and has since then made children's short films and television series. She has primarily dedicated her career to writing, illustrating, & animating children's television programs, including the popular tv show "Lillefinger." Lauren is from Los Altos, California and currently works out of Chicago, Illinois. She attended Northwestern University (where she befriended ACE coordinator Martha Marie Petri) and got a dual-degree bachelors: Bachelor of Music in Voice Performance and Bachelor of Arts in Spanish. Music Festival, and the Aarhus-based contemporary choir Ensemble Edge. ​and is very excited to be part of the ACE team as we build toward the 2018 Expo!